We are excited to provide dental care with a personal touch to Conover and the surrounding area. Our patients’ comfort is our highest priority and we work to ensure that every patient has a pleasant experience. Our goal at Conover Dental is to make every patient like a member or our family and to form long-term relationships with all of our patients. We offer several financing options to make your dental care affordable. 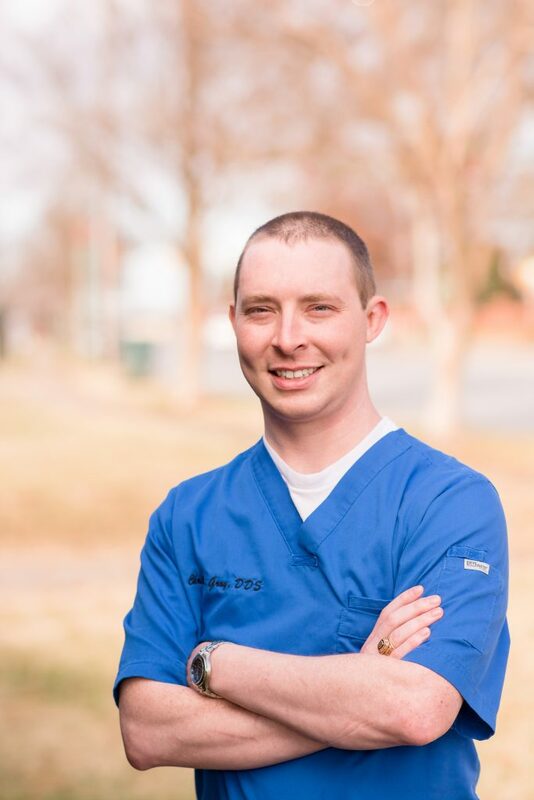 Dr. Chris Gray was raised into dentistry by his father and grandfather. His experience with dentistry started early as he worked in a dental lab and also assisted his father, Dr. Robert Gray Jr. He would eventually attend NC State University for a bachelor of science degree in biochemistry and then UNC Chapel Hill School of Dentistry for his D.D.S. He was the recipient of the school Endodontics award through the American Academy of Endodontics for achievement in both clinic and academics. Dr. Gray is excited to be a part of this team and is ready to continue on the family tradition of high quality dentistry. My fear of dentists were quickly diminished from start to finish of my appointment. They talked through everything and made me feel so comfortable. I look forward to my cleanings now. They also care about our community when they answered the call to help our local school with proper dental hygiene kit for kids gifts. I highly recommend Dr. Gray and his staff! I felt like family from the very first phone call…I am in need of cosmetic dentistry but I am terrified of the dentist! I broke down in tears but Dr. Gray physically held my hand and assured me that I would have a beautiful smile and that he and his staff would do everything possible to make it happen. They offered payment plans, sedation,(if needed) and moral support. His staff was kind and supportive. I would have most likely declined the work that I desperately need because of fear but I am choosing to “bite the bullet”give them a try. My consultation was free so I had nothing to lose and neither do you! I am a new patient at Conover Dental. I had a great experience and the rest of my family will be going there soon. Everyone was very professional, the facility is very up to date and uses the latest technology. Dr. Gray was very personable and a pleasure to talk to. I am 47 and he appeared to be a lot younger than me, so, I hope to have him as my dentist for a very long time. Thank you Conover Dental! Conover Dental very kindly opened their doors for us Veterans for free dental services on Veterans Day. My story is not the usual cleaning and a free toothbrush, TRUST ME! I have been suffering from two MAJOR cavities on the top two front teeth that have embarrassed me to no end, which drastically affected my life. I avoided social functions, felt unattractive, absolutely DID NOT allow myself to be photographed and literally DIDN’T SMILE for over three years! Dr. Gray and is staff made me feel very welcome, thanked me for my Service, and Dr. Gray himself assured me that he would do everything he could to make me happy to smile again, which he did! They gave me a good cleaning, did extensive x-rays and filled both cavities to the point to where they are no longer noticeable! They also offered me affordable prices with FREE WHITENING FOR LIFE! To put it mildly, I wasn’t expecting to be treated so special with the amazing level of care that Dr. Gray and his staff provided me that day. I noticed myself felling like a friend, or member of the family, and not just a patient! I am now a patient of Conover Dental and encourage EVERYONE to join me, if you’re interested in getting the best care from the best in the business. I can honestly say, “Dr. Gray and Conover Dental literally changed my life forever and I can never thank them enough”!!!!!!!!! !